Want to upgrade to Windows 7, but not sure if you old PC, aged system or intend-to-purchase new computer is able and can run Windows 7 when it’s officially released to retail customer? Microsoft is offering a tool called Windows 7 Upgrade Advisor that can be used to determine if a PC is able to run Windows 7. 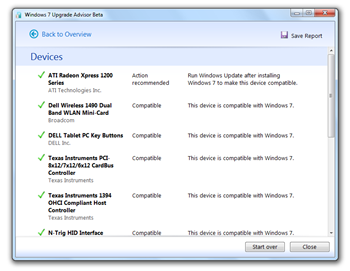 Windows 7 Upgrade Advisor can analyze the PC to determine if it’s Windows 7-ready or capable to upgrade and run Windows 7. 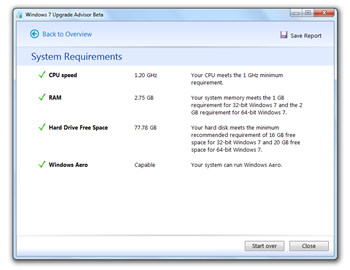 Microsoft has released the final minimum system requirements for Windows 7, which roughly similar to those required by Windows Vista. Thus, generally speaking, Windows Vista users should be able to upgrade smoothly from Windows Vista. 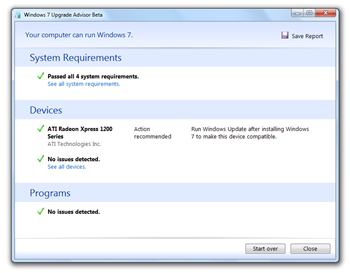 For users still in doubt, or using old machine, Windows 7 Upgrade Advisor can examine a PC’s processor, memory, storage, graphics capabilities, and identifies known compatibility issues with installed software and devices, then provides guidance on how to resolve those issues if possible. In the Windows 7 Upgrade Advisor, the test will be conducted if the PC fulfills the following system hardware requirements. In addition, test will also be conducted to all devices present in the system to see if the drivers are supported and compatible. Thus, it’s recommended to plug in and connect any USB devices or other devices such as printers, external hard drives, or scanners to the system. However, do note that even if your PC is fully compatible with Windows 7, direct upgrade from Windows XP to Windows 7 is not support, and user has to perform a clean install of Windows 7. Only Windows Vista PCs can upgrade to Windows 7. Windows 7 Upgrade Advisor is now available in beta in final RTM from Microsoft Download Center. The final version of Windows 7 Upgrade Advisor is expected to be released together with Windows 7 RTM on Windows 7 homepage.